Chez nos ancêtres les gaulois. 39, Rue Saint Louis en l'île, on the always charming Ile Saint-Louis (41 euros). Metro Pont Marie. You can eat as much as you want of everything here (except your main course), and drink as much, too. Go hungry and expect to get very drunk. This one can be really fun, especially if you're with a small group. It's better to avoid this place, by the way, if you're with a large group, for reasons that will be obvious once you get there. People will come in and sing traditional (and hence sickening) folk songs, and they'll possibly try to make you sing, too. Refuse adamantly. There are these huge vats of wine in various locations around this cavernous (in every sense of the word) restaurant, and they give you a pitcher; you then get up and fill your pitcher, and you can keep on filling it (and emptying it) until you can no longer stand. You eat pretty much the same way. One thing: don't let the waiters try to rush you. They'll ask you when you get there "si vous connaissez le système" (if you know how this joint works); make them explain it, but here's what they'll do: they'll bring you a huge (I mean really huge—you won't understand that I'm not exaggerating until you see this) basket of raw vegetables as a first course, and you select what you want as a sort of salade de crudités and make your own dressing with the mustard, garlic, and oil, etc. provided. Eat as slowly as you like, and if the guy asks you if you're done, tell him NO if you're not (and you won't possibly be able to eat all the food they put on the table—you'll see what I mean when you get there). The same goes for the next course, which is a "charcuterie" (sort of deli) course, that you have to get up and go get yourself. There are some really nice salads and saucissons, etc., and some things you don't want to know about. Oh, and while you're up, you might as well fill up your pitcher with wine again. The meat course will be some choice of a brochette (skewer-type thing) or grillade (grilled-type thing) or something, and you only get one helping of this. Oh, and you can refill your pitcher of wine now. Then they'll bring you this enormous cheese board and you can pig out on that; and then they'll ask if you want dessert, which is not included in the price, so if by some miracle you're still hungry and order desert, you'll pay a little extra. This place is fun and strange and well worth a visit. If you go, I'd recommend going late—like after 10:00 or so. In the Montorgueil quarter, make sure to visit Stuart Friendly, which is both vegetarian and vegan friendly (but they do serve meat as well). The uncommonly friendly staff greet you warmly in a sort of high-tech, high-concept environment that sounds cold as I describe it but is actually quite welcoming. 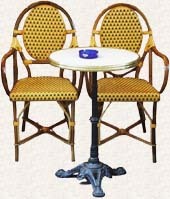 This restaurant bills itself as "Le premier Restaurant, Brunch, Salon de thé non-fumeur et hétéro friendly de Paris!" (which I think you can probably translate for yourself). The owner is very nice, and if he has time he'll stop and chat with you. They're at 16, rue Marie Stuart in the 2nd arrondissement (01 42 33 24 00; metro Sentier or Etienne Marcel). Brunch is served Saturdays, Sundays, and holidays, and you should expect to pay in the neighborhood of 20 euros. Also in the Montorgueil quarter you should go to Au Rocher de Cancale at 78, rue Montorgueil, 2nd arrondissement (01 42 33 50 29, metro Sentier or Etienne Marcel). This establishment dates back to 1846, and they serve more or less traditional food with modern twists. They have really appealing and large salads here, and if you get a table facing the street you're in for some very first-class people watching (figure about 22 euros). At night this place becomes a pretty hip café for your evening drinking and viewing pleasure. It's a fairly young and mostly local crowd, but reasonably friendly. Right nearby is the truly lovely Epi d'Or. Located at 25, rue Jean-Jacques Rousseau (01.42.36.38.12, metro Louvre-Rivoli). L'Epi d'Or is the best kind of mix of old-fashioned and cutting edge. 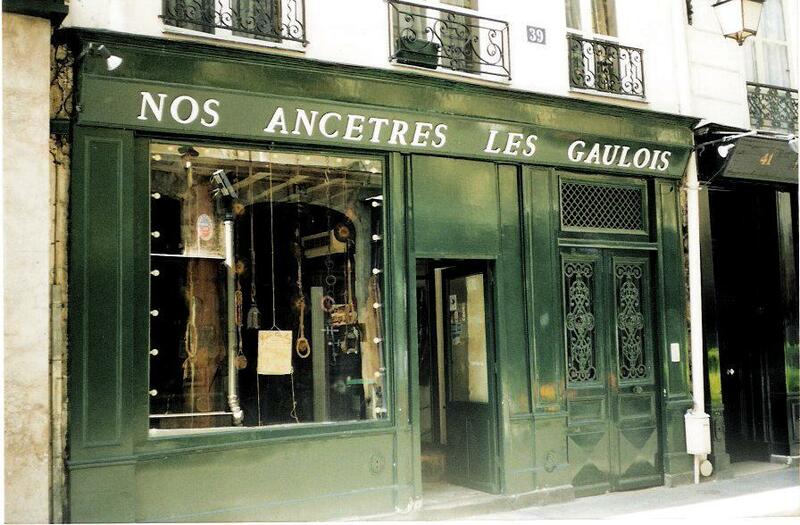 Sadly, the first soul food restaurant in Paris—heck, in Europe, it turns out—has closed. Haynes ( at 3, rue Clauzel, in the 9th) was founded by Leroy Haynes in 1949. An American GI, he married a French woman and basically never returned to the U.S. after the war. I think he was from Georgia (I could be wrong—I only talked with him a couple times—I lived 5 or 6 doors down from this terrific restaurant). He had a number of credits in movies in the 60s and 70s (here's his IMDB credits). He was quite a figure. The restaurant moved to its location on the rue Clauzel in the mid sixties, and it was a sort of mecca for years and years. Here's a really interesting article on this amazing place. Two especially interesting brasseires are Brasserie Flo (7, cour des petites écuries, 10th arrondissement, Metro Chateau d'eau [01 47 70 13 59]) and Julien, 16, rue du faubourg St. Denis, both at Metro Strasbourg Saint Denis (01 47 70 12 06). Don't confuse the COUR des petites écuries with the RUE des petites écuries (you want the COUR). If you do confuse them, you'll never be seen again (idle threat). Flo is a bit hard to find, but keep looking, because I guarantee you, it's worth it. You have to go through a little doorway in the side of one of the buildings in order to gain access to the passage. Julien is easier to find (and that's Julien at right), but you ought to note that for both of these restaurants, you shouldn't be afraid by the neighborhood despite its slightly sinister appearance. You might see some frightening looking people on your way here, and maybe a prostitute or two, too, but no one will bother you or even pay attention to you. Neither of these places is cheap—probably about 40-75€, depending on how excessive you feel—but well worth it for the big splurge, such as last night stuff, celebration, etc. Get a Kir Royal as an apéritif if you have any extra money hanging around—it's the house drink and it's made of champagne and crème de cassis (black current liqueur). Both of these are 19th-century restaurants, kind of loud and the waiters are a little gruff; this is the way it's supposed to be, and the service is usually quite good (although a waitress at Julien spilled a half glass of red wine on me once—but to their credit, the management took care of it). The food will be really good, carefully prepared, and nicely presented. On top of it all, you can dress rather casually here, too (but don't get carried away). Unless you frequent 4-star restaurants a lot, this may be the best food you've had in a very long time. I think I prefer Julien (above right) just a bit to Flo, maybe only because it's bigger, a bit more bustling, and for some reason, even though these are owned by the same company, the food seems just a little bit better prepared here. Au pied de cochon (image at left), 6, rue Coquillière, right near the bourse du commerce and les halles in the 1st, Metro Les Halles (01.40.13.77.00). This is an old favorite, and it belongs in the same category as Flo and Julien, described above. Used to be very popular with the market regulars when Les Halles was still functioning (Les Halles was the open market that had been functioning on this site since the twelfth century), and it's a striking mixture of elegance and casual chic. You can go there any time of day or night—it's open 24 hours—and gorge out, or pop in simply for a bowl of onion soup. If they try to seat you upstairs, refuse adamantly—insist on a seat on the ground floor. If the Pied de Cochon doesn't move you, or if it's just not what you're looking for, you'll find that any of the restaurants in this little cluster (just look to your left) are quite good. In the summer they all have outdoor seating (this is a very nice street), and they're all pretty much in the same price range (expect to pay 30–45 euros). Nearby, in the Montorgueil/Les Halles district is the splendid Pharamond, at 24 rue de la Grande Truanderie (01.40.28.45.18, metro Etienne Marcel). This restaurant, which serves in a lovely courtyard during the summer, is a classified historical monument inside: its turn-of-the-century decor is beautifully impressive, and the staff are extremely friendly. 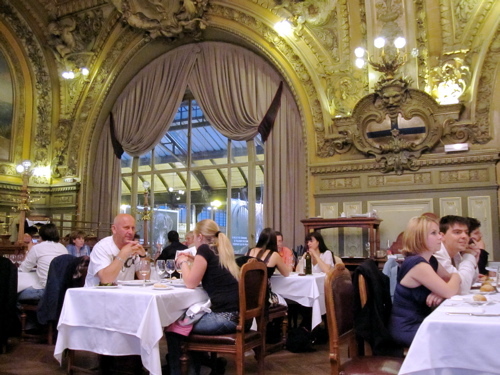 The menu is more or less classic French, and prices are in the neighborhood of 25 euros per person. This is one of Tom's new favorites. 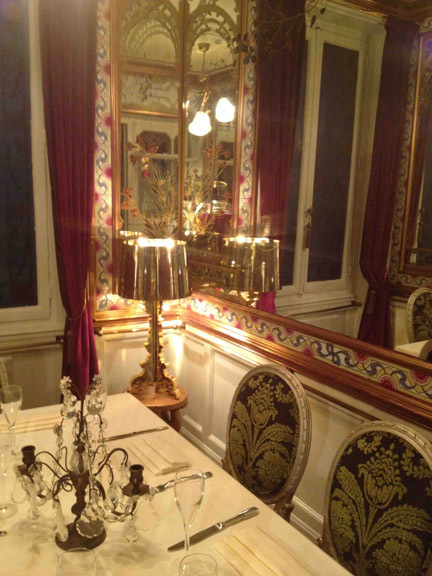 Oh, and by the way, Pharamond has private rooms upstairs that are done up in a gorgeous late nineteenth-century style that you can reserve (see right). 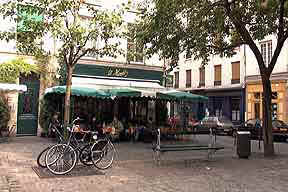 When you're in the marais, check out the rue des Rosiers, which has treats such as Micky's Deli, at no. 23bis (01.42.77.12.75), L'As du falaffel, at no. 34 (01 48 87 63 60), and Chez Marianne (which is actually on the corner of the rue des Rosiers and the rue des Hospitalières St Gervais—01 42 72 18 86). More restaurants in the marais to come... But wait: Jo Goldenberg's, shut down for some time now, is closed for good. This is very sad. If you've just spent time in either the Picasso museum or the Musée Carnavalet, you might set yourself down for lunch at Le Sévigné, a smart little bar/brasserie right in the neighborhood of these great museums at 15, rue Payenne (01.42.77.00.98). You'll find a surprisingly extensive menu with huge and tasty salads, inventive pizzas, club sandwiches, classics such as the croque monsieur, and more. The service is extremely friendly and personable, and the ambiance is warm and homey. Still in the marais: On a warm summer evening head over to the place du marché Ste. Catherine in the 4th (metro St. Paul), just off the rue Caron. A half dozen decent restaurants occupy this charming, quiet little square that seems totally removed from the busy city around it, and they spread out into the space with overhead lights, plants, and just about everything you'd want that screams with ambiance. You won't believe you're in a huge city here. Although the restaurants are hit and miss—but all perfectly serviceable—they're reasonably priced and you simply can't do better for incredibly charming ambiance in the summertime. 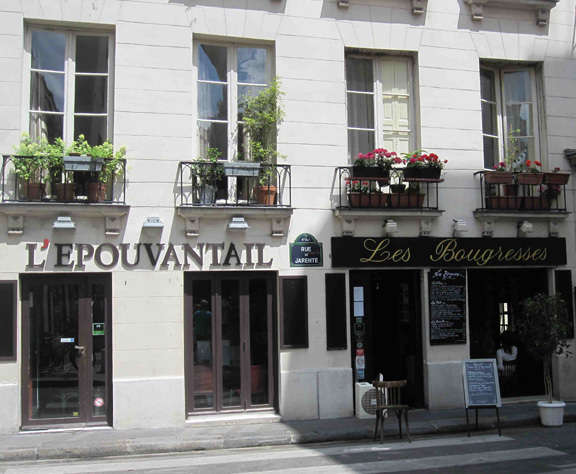 If you want less atmosphere (i.e., you'll be eating inside) but slightly better, perhaps more interesting food, check out L'Epouvantail (01 40 29 03 03) or Les Bougresses (01 48 87 71 21), both at 6 rue Jarente, just at the top of the square. Tom loves Les Bougresses. The staff are friendly, a bit sarcastic and funny, and the food is very carefully prepared, it's delicious and inventive, and they have great apéritifs and deserts. That means you start well and finish great. Check the place out. And it also turns out that the marais is a good place to walk around in, too, and on the Neat Places page you'll find suggestions for where to roam. Keeping things slightly high-end festive here, I have to recommend Le Train Bleu, mainly because it's so over the top and weirdly elegant, right in the middle of the ornate train station, the Gare de Lyon (the official address is 1, place Louis Armand, but it's in the Gare de Lyon, 12th arrondissement, metro of that same name [01 43 43 09 06]). My guess is that this is where wealthy travelers dined before boarding their first-class trains headed to the Riviera. The gilded vaulted ceilings and ornate lighting certainly recall an earlier (and richer) era, but the menu is contemporary traditional. The food is carefully prepared and presented (although the service can be somehat indifferent), but the reason to go here is for the combination food–décor. It's sort of like entering another world, really (but it's too bad the staff don't all appreciate it: one night I was there one of the hostesses whipped out a spray bottle of kitchen cleaner right at the front door and started cleaning the menus, which makes you wonder what people were doing with them); make sure to go the bathroom so you can check out the Big Ben Bar (which is coterminus with the restaurant). It's got these big old fantastic leather chairs, and the brunch rooms, with their windows opening out onto the square below, are luxurious and evocative of something well-heeled and tastefully lavish (you can also polish your shoes right outside the bathroom). All of this doesn't come cheap: expect to pay in the neighborhood of 80 euros or significantly more. You'll find good couscous, and surprisingly cheap, at Le Delly's, which bills itself as a "restaurant africain" (5 rue des deux gares, 10th arrondissement, metro Gare du Nord or Gare de l'Est [01 40 34 90 74]). It's in a neighborhood you otherwise might not find, between the Gare de l'Est and the Gare du Nord, and there's somewhat raucous crowd up front downstairs, and a quieter dining room upstairs. The staff is friendly and bantering, and they might offer you a snort of fig liqueur after dinner. Expect to pay about 20 euros all included. A new discovery is Au Clair de Lune, which does absolutely marvelous Moroccan couscous. It's in the Montorgueil neighborhood at 27 rue Tiquetonne, in the 2nd (01 40 26 12 39, metro Etienne Marcel). The service here is uncommonly friendly, the food is top notch, and you can't beat the price: you'll enjoy drinks and dinner for between 20 and 25 euros. I should point out that Tom doesn't like to un-recommend restaurants, but if you want really good couscous, you might not find it in the pedestrian streets in the Latin Quarter. 'nuff said. One of the smallest restaurants you'll ever see is the Cochon à l'oreille, at 15, rue Montmartre (01 42 36 07 56, metro Les Halles), in the old les Halles district. Run by a harried middle-aged couple who chat a lot with neighborhood regulars, this restaurant has only 6 tables inside, but in good weather they set up 4 or 5 more out on the sidewalk terrace. 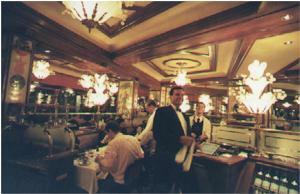 Here they serve traditional brasserie food and good salads, nicely prepared and inexpensive. Despite the overall pig theme (and check out the display of pigs doing strange and impossible things they have above the bar inside) you'll find a good variety of menu offerings. Make sure also to look at the large ceramic farm scenes in the restaurant's interior, produced locally (and quite some time ago) on the rue du Paradis, once famous for its ceramics and porcelains, and now home to the china and flatware wholesalers. This is really a perfect place to have lunch, since there's every chance you'll be in this neighborhood anyway. Go here and I promise it'll be an experience you haven't had outside of Paris before. The Oberkampf area has a number of great restaurants that you should know about. Look in particular at Astier, at 44, rue Jean-Pierre Timbaud (metro Parmentier, Oberkampf, or Goncourt [01 43 57 16 35]). This fantastic restaurant looks like a little house in the middle of Paris, and when you're dining, whether downstairs or upstairs, you feel like you're in someone's country dining room. The rustic décor features local woods, and the close and comfortable surroundings make you feel like the other diners are your friends. The place has been around for over 50 years, and they feature what they all "nouveau bistro" cuisine: traditional fare injected with more basic elements. Menu and à la carte; figure about 40–50 euros, and reservations are recommended (which you can make on line). Right nearby is L'autre café, a large and rambling (two-story) place that occupies a great corner spot at 62, rue Jean-Pierre Timbaud (same metros as Astier; 01 40 21 03 07). The ambiance of the place is simultaneously sophisticated and downright homey. The staff will go out of their way to make you comfortable, and whereas Astier is close, this place is expansive. Sit in one of the sofas upstairs and read the news (newspapers and magazines scattered about); grab a drink; or dine on the very reasonably priced café menu on such things as a vegetable wok, duck breast, or grilled sirloin. You won't pay more than 18 euros for any of these. Check it out. Still in the Oberkampf area, make sure to check out Le Trou Normand ("The Norman Hole"). This is a restaurant you're never likely to find on your own (01 48 05 80 23), but you ought to know about it. Located at 9, rue Jean-Pierre Timbaut just off the quieter part of the rue Oberkampf (metro Oberkampf), this is another hole-in-the-wall restaurant serving good, solid, and very cheap northern French food with a little bit of Italian tossed in. There's nothing fancy here, and the team of young waiters who look as though they stopped off to work here just before heading out to the bars up the road will be very friendly and helpful. If they like you they'll even buy you an after dinner digestif, so be nice. We're talking in the neighborhood of 15 euros here. Very good wine list and not at all expensive. (There's another Trou Normand on the avenue Parmentier, but I don't know if it's run by the same people or if it's any good, since I've never been there. Feedback, anyone? [Update: a reader responds]) In roughly the same neighborhood is the strangely named Ave Maria, at 1 rue Jacquard (opposite no. 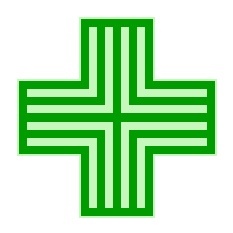 61 rue Oberkampf, 01.47.00.61.73 metro Parmentier or Oberkampf). This restaurant has accomplished the difficult task of being one of Tom's new favorite restaurants. It's world cuisine, which means a strange mishmash of Mexican, Brazilian, French, and whatever. You're likely to find watermellon, passion fruit, chicken, piquant sauces and who knows what else in the earthenware crockery your food comes in, and the absolutely charming waitstaff will go out of their way to help you. Do go here. You might also like the Bakara Lounge, also in this neighborhood, at 61, rue Jean-Pierre Timbaud (01.48.07.17.04, metro Parmentier or Oberkampf). Wait—I think Bakara Lounge is now closed. Anyone? A good many restaurants have fluffy guardians. 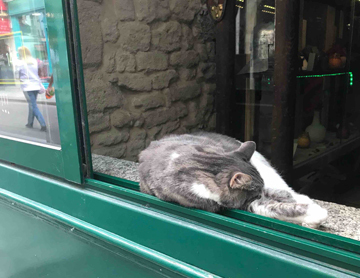 Cats are no strangers to Parisian restaurants, and owners and patrons are equally fond of them. Someone once told me she thought that restaurants that have cats are unclean (because they have mice, hence the cats), but I haven't noticed any correlation between restaurants with cats and lax health standards. 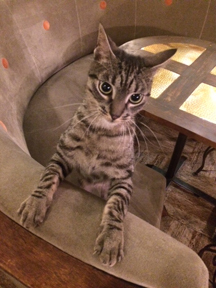 My favorite restaurant cat was Polo, who owned Le Train Bleu. Polo has gone on to a better place. To the right is Alex the restaurant cat at Chez Bébert, a couscous restaurant in the Montparnasse neighborhood. Try in particular the Villa du Poulebot, on the Place Charles Dullin, (actually at 10 Rue Dancourt [metro Anvers]). There are two menus, both quite inexpensive, and they're both very good. Try also the Rue des Trois Frères, Metro Anvers. Go up this street, and you'll find many interesting, quirky, and reasonably priced restaurants. If you don't want to spend much money, you might want to try Le Buffet, at 18, rue des Trois Frères. They have a reasonably priced menu which does not, you should note, include dessert, but you can order the "Buffet" for your first course, which is sort of like a French salad bar—very unusual, actually, and with lots of good stuff on it that you can load onto your plate. I would avoid the restaurants all the way up the hill on the Place du Tertre, because they'll be expensive and not very good. Too many tourists, really (don't you love it when someone says that?). An interesting place just off of the top of the hill which I used to recommend is La Maison Rose, which is, in fact (as the name says), a little pink house—it was also the subject of a Maurice Utrillo painting. If you're at the top of the hill, at the Place du Tertre (where all the artistsare), go down the very busy Rue des Norvins and turn right onto the Rue des Saules. Go down the hill to the corner of the Rue de l'Abreuvoir and you'll see the little pink house at number 2 (01 42 57 66 75). 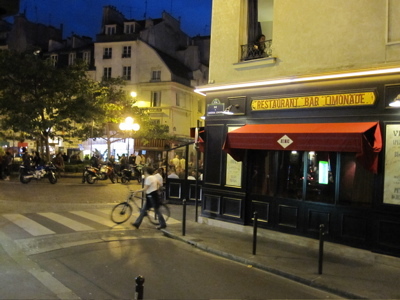 I say I used to recommend it, because the last time I went it was pretty touch and go; usually, however, it's very good, quite charming, and it's a terrific place to have dinner outside in Montmartre on a warm summer's night. Again: go late. Let me know how it is, OK? Chartier, 7, rue du faubourg Montmartre. An institution (metro Grands Boulevards). This is a restaurant that you really should go to, just because of its history (they claim three centuries of service to 50 million people!) and its strange, loud, hectic ambiance. The food isn't remarkable (but it's certainly quite decent). This is one of the rare occasions when you should order à la carte (and they post their very reasonably priced menu on the web daily). Very crowded and noisy, the waiters will be gruff but charming, and they'll write your order directly on the paper table cloth. If you're young and/or on a budget, you'll absolutely love this place (pictured here). 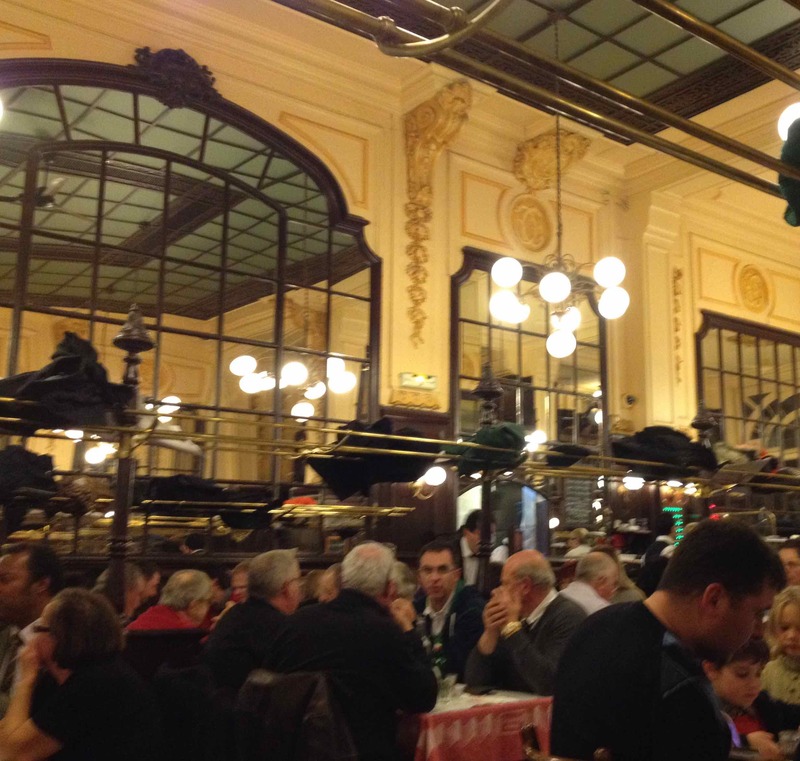 Chartier is the sort of grande dame of the great inexpensive restaurants. If you are alone or with only one other person, expect to be seated at a table with someone else. This is OK, so just cool out, will you? You'll probably actually enjoy yourself. 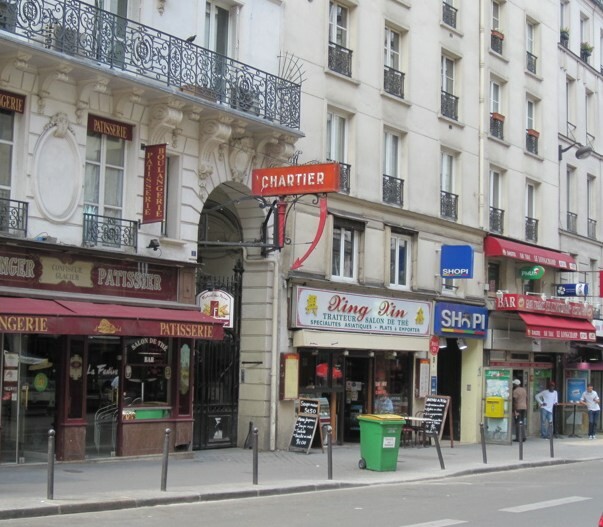 Someplace you're not likely to find that has a nice concentration of interesting restaurants is the area around Saint Roch and the rue du marché Saint Honoré (1st arrondissement). Take the métro to Pyramides, and then go down the rue des Pyramides to the rue St. Honoré. 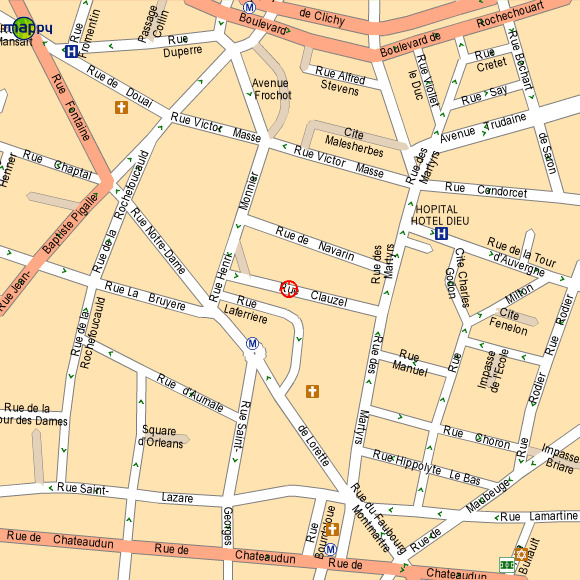 Turn right and head over one block, just past the church, to the rue Saint Roch. Turn right again, and head up the rue Saint Roch. Here you'll find an unusual mix of traditional auberge-style restaurants with new wave Japanese restaurants. If none of these strikes your fancy, keep going straight until you get to the rue Gomboust, turn left, and proceed on over into the square ahead. You'll find the marché Saint Honoré here, and all around it, particularly heading down the rue du marché Saint Honoré, a collection of upscale restaurants, each in a different style. Look especially at L'Ecluse and L'Absinthe. You'll likely agree that Nomad's is a good place for an after-dinner drink, and they often have live music with no cover charge (and you're in for a special treat if René Miller's Wedding Band is playing). 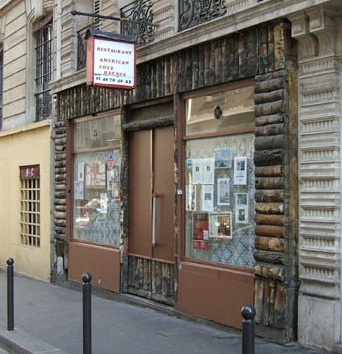 OK, here's another challenge to Tom's readers: for years I've wanted to go to Chez Julien, pictured at left, but have never gone (1, rue Pont Louis Philippe, 4th arrondissement). Anyone been here? It has always looked completely charming to me, but for whatever reason I've never gone. Who's been? Tell us all. 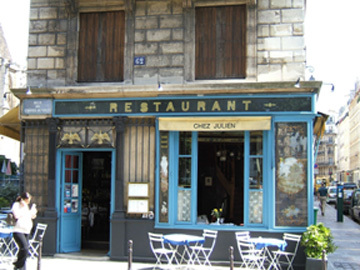 UPDATE: Well, I noted here some time back that I had always wanted to go to Chez Julien. I finally went, and I have to say it was a pretty mixed bag. On the one hand, the ambiance is absolutely charming. You can see from the photo here that it’s a beautiful little establishment —turns out that it was founded in the 18th century—and inside it’s as nice as the outside promises. It’s quite small and intimate, so you might well be forced to listen to your neighbors’ conversation. The food is beautifully prepared by someone who quite clearly knows what s/he is doing, but all of this is marred by indifferent service. I’m not especially fussy (God, I hope none of my friends is reading this), but the service wasn’t bad—it was simply rude. When our waitress brought the wine, she held it backwards so we couldn’t read the label, and she quite literally threw things on our table. At desert I ordered the mousse au chocolat and my companion selected the cheese, and the bread for that course was given to me. Someone else should go here and correct me if I’m wrong about anything here. I’d still go back; I’d just hope the same person wasn’t working that night. Leslie was impressed with Breakfast in America, at 4 rue Malher in the 4th (01 42 72 40 21; metro Saint-Paul—but there are three locations [ndlr]). Leslie writes: "My friend, who does not like croissants, pain au chocolate, etc., was looking for a restaurant where we could have eggs, bacon, and toast. We discovered the Breakfast in America restaurant and she was delighted! Needless to say, we ate there several times for breakfast and lunch (the cheeseburgers and milk shakes were delicious)!" Dave D likes Le Chateaubriand, at 129 avenue Parmentier, metro Goncourt (01.43.57.45.95): "Le Chateaubriand with Chef Inaki Aizpitarte at the helm. One of the best restaurants in town for those wanting to experience Parisian fine dining (rather than casual bistro fare) without spending too much. 55 eurow for a 6-8 course prix fixe no-choice dinner of a lifetime. Although no Michelin stars as of 2012, it has been ranked among the top 50 restaurants in the worldfor a few years running now. Also highly regarded among chefs around the world. The chef's newest venture is 1 or 2 doors down called Le Dauphin. Prix fixe lunch and à la carte tapas-style dinner menu. Even more affordable. Both top notch cooking but casual setting. Reservations highly recommended—2 weeks in advance maybe." Jackie swears by the Jules Verne Restaurant, located on the Eiffel Tower itself, but she also cautions that you need to reserve well in advance (01.45.55.61.44), and adds that "the view is magnificent!" Beth and Bruce of Dallas were completely charmed by the Hotel du nord (102 quai de Jemmapes, tenth arrondissement, metro Garde de l'est or Goncourt 01.40.40.78.78). "It's white tablecloth, but not snooty; there's an upright piano in the dining room, and every once in a while someone would just go up and start playing." 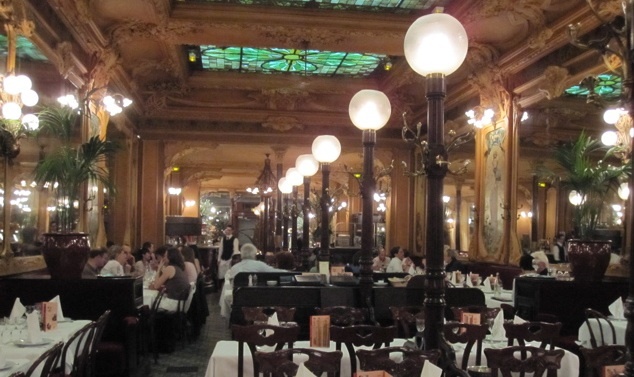 John and Sharon roamed the ninth arrondissement and strongly suggest two places to eat. The first is Sous le Jasmin, a place for couscous and tagines, at 66, rue Blanche (01 49 70 06 75, metro Blanche); and they went a bit overboard recommending Le Bistrot Papillon (6, rue Papillon, 01 47 70 90 03, metro Cadet) a turn-of-the-last century bistrot with a 27-euro menu and a large and reasonably priced wine list. Sue is especially impressed with Zinc Zinc, at 209 Ter (209C, basically), avenue Charles de Gaulle in Neuilly sur Seine. (Neuilly Sur Seine is a suburb of Paris, but it's so close that you won't even know you're not in Paris—and the metro will take you there without any special ticket or anything. Just get off at Pont de Neuilly.) Sue writes: "Food excellent, service superb, prices resonable, atmosphere relaxed. And even though their English is as limited as my French, they are very patient and downright nice. Big thumbs up every time I go there." Sandy from Illinois also likes Brasserie Balzar and Allard, but she also recommends "a little restaurant on the Place Dauphine called Le Caveau du Palais (38, rue des Tournelles, 4th [01 42 71 43 33]). They have the best Confit de Canard with crispy fried potatoes, and wonderful Tarte Tatin – they don’t skimp on the Crème Fraiche! 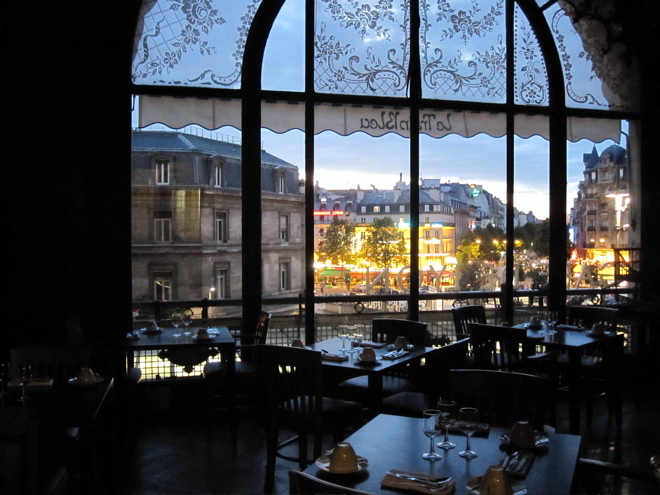 We also enjoy Bistro de Breteuil, not far from Invalides (3, place de Breteuil, 7th [01 45 67 07 27]). They have a very reasonably priced prix fixe menu, including a bottle of wine (for 2 people) and coffee at the end of the meal. I just checked their website, and the price is 33 euros." An anonymous reader (who I'll bet is French) is extremely enthusiastic about L'Ambassade d'Auvergne, at 22, rue du Grenier Saint-Lazare in the third arrondissement (01 42 72 31 22; metro Rambuteau). 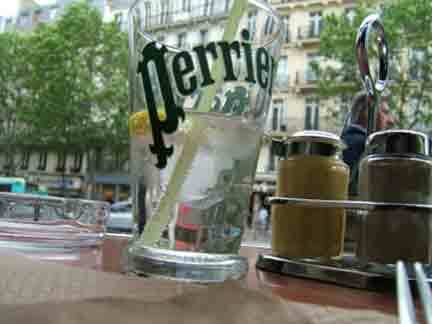 "This is really my favourite restaurant in Paris. Typical food from the Auvergne region (you must eat an aligot once in your life, that is, mashed potatoe with a special cheese, but really more sophisticated than that), the lamb is excellent, in a superbe decor, delicious food, neat service and not that expensive especially as they offer lot's of small things during the meal : terrine with the aperitif, fouasse and conquises with the coffee. Very pleasant, relaxed-smart atmosphere. And it's opened on sundays." Colin enjoyed the Auberge Nicolas Flamel (51 rue Montmorency, third arrondissement, metro Arts et Metiers, Etienne Marcel, or Rambuteau: 01 42 71 77 78), in the oldest house in Paris: "I thought I'd made a huge mistake when I went into this street but the reality was something else. Home to Nicolas Flamel, a 16th-century (I think) french alchemist it's supposed to be one of the oldest residential houses in Paris. Inside it's huge guilt mirrors, candel light and very few electric lights. Service was first class. The floor is run by one very efficient lady. There are only 12-15 tables downstairs so it's very intimate. Food is exceptional (try the pot au feu seafood casserole). My girlfriend said it was THE most romantic restaurant she'd ever been to and it made her cry. Booking is strongly recommended. Dan in Florida likes Ma Bourgogne, at 19 place des Vosges in the 4th (metro Saint-Paul, Bastille, or Chemin Vert: 01 42 78 44 64). Dan writes: "This place has been there for a long time in any area that has seen a lot of changes. An inexpensive (well, considering the location), traditional Burgundian place on one of the most beautiful little squares in the city—a 17th-century gem. Order a bottle of chilled Brouilly and something off the list of hearty, country-style dishes!" Patou writes about the Auberge Pyrenees Cevanne, 106 rue de la Folie Mericourt, (11th) 01 43 57 33 78. "This absolutely charming, warm, authentic resto in the 111th is run by the amazing Françoise and her family. Delicious Lyonnaise specialities, like the fantastic cassoulet, and calves liver. Charming decor, non-touristic. This is a must for us every year when we rent our apartment in Paris." OK. I've told you my favorite places, and other readers have given theirs; now it's your turn to add something to the guide. 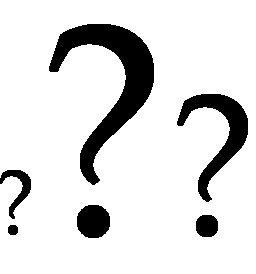 Do you have a favorite place that you always go to? Whether it's a 4-star extravaganza or that little hole in the wall that serves your basic meat and potatoes kind of meal, Tom's Guide wants to know about it. Click here to suggest a restaurant of your own.